On tuesday april 2nd, West Clermont High School had an ALICE lockdown drill. Around 2:20 pm, the students in the school were to evacuate the school and go to the “safety zones” around the school. The three locations are : the football field home stands, Mount carmel Christian Church, which is right across the street from the school, and the last place is the Southern Ohio Manufacturing inc, which is on the other side of Clough Pike. Of course since this was just a drill, so the students had a specific spot to go to based on what floor of the building they were on. But in a real emergency it is important that they would go to the location that is closer and safer for them to go to. What does ALICE drill stand for? 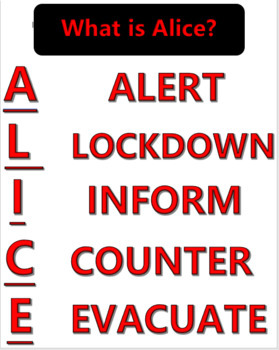 “ This is often referred to as ALICE training, where ALICE stands for Alert – Lockdown – Inform – Counter – Evacuate or run – hide – fight, a federal Homeland Security Department program originally created for use in workplace settings. Training of school staff, who are legally and morally responsible for the safety of children, should be the focus. Teachers, administrators, school police, and other staff should continue to take the primary lead for protecting students. A question often asked is : Should schools train secondary and elementary students to throw objects and physically attack armed intruders in their classroom? As I said earlier ALICE can also be known as Run – Hide – Fight, as you can see fight is the last part in the sequence. So I believe that fighting can be helpful as to distracting the intruder but it should be the last result and you should try to run if safe, but of course if running is not a safe option then hiding is the next best thing. In schools and in the classroom, teachers should talk about where you could hide throughout the school and especially what yo do when you are in the bathroom. But if the running and hiding are not available to you and you are in contact with the intruder then it would be best to start throwing anything you can to distract the intruder and try to always be in motion. If the intruder is armed and you are throwing items and moving around that would not make you an easy target.